I don't know about everyone else, but switching sewing machine needles for different materials etc always gets on my nerves...i always get them mixed up (im not a put-it-back-in-the-right-box kindof person) and then i'm in the half-light squinting and trying to read the tiny numbers etched on the side, and then i need to get out the book to tell me which size goes with which material...bla bla bla...basically - it's a pain. 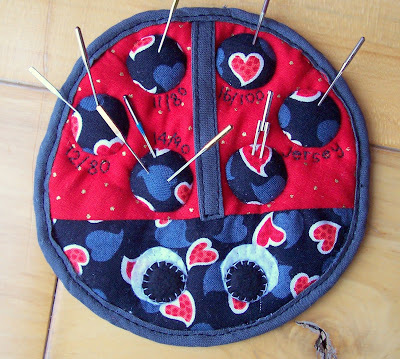 So i decided to make a quilted needlebug hanger to keep the needles in order. I made little spots for the different sizes of needle and separate ones for the jersey needles / leather needles and twin needles etc. 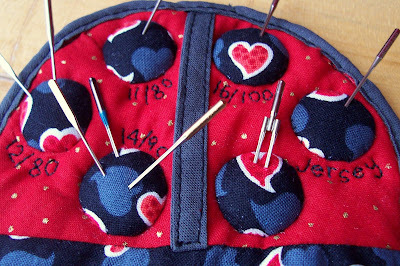 The little spots were made using the method of the padded magnet covers, and then just sewn on to the body of the ladybug. I embroidered the sizes underneath to keep myself right! No more confusion...let's hope!